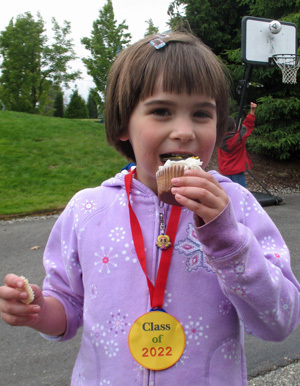 Graduation 2: On Wednesday, June 16th, Sofia finished kindergarten at Woodinville Montessori. Her class had held a "moving up" ceremony the previous Friday for all the kindergarteners. After the last half-day of school, we gave a party to honor the seven neighborhood kindergarteners who had all graduated. They received "medals" to wear that said "Kindergarten Graduate June 2010" on one side, and "Class of 2022" on the other. Graduation 1: On Monday, June 14th, the family attended commencement ceremonies at Juanita High School to watch Cameron complete his high school career (see Cameron's Album). The two-hour event in the Field House concluded with photos of Cameron and his friends, some of whom had been in Cameron's classes since first grade! Cameron is excited to be attending the the University of Washington in September. Senioritis: Cameron has it bad. With only one week of high school to go, Juanita High held its Senior Prom on June 5th. The kids were unexpectedly blessed with a beautiful, sunny day in the midst of a miserably cool and wet week. Cameron and his date, Amira K., along with seven other couples, rented a mini-bus to drive them to Kerry Park on Queen Anne Hill in Seattle for photos, then the Icon Grill for a fancy dinner, and then to the Seattle Harbor Club for the dance. They all looked great [below] and, reportedly, had an awesome evening. Cameron and fifteen other friends pose at Kerry Park in Seattle as family take photos. Eighteen: Cameron turned 18 at the end of April. In part he celebrated by spending the preceding weekend with four friends in Ocean Shores, Wash., watching the Rally America Olympus Car Rally. The independent weekend included some car trouble and expense (welcome to adulthood! ), but he saw Travis Pastrana and met Ken Block, two well-known professional rally racers, and all in all they had a birthday blast. Dutch volcation: Jan and Sofia left for a family visit in the Netherlands on March 30th. Sofia loved visiting her Oma and many aunts, uncles, and cousins. She successfully spent some part of each weekday in Dutch kindergarten. They visited several special parks where Sofia was able to go "bungee jumping" on a trampoline and float on "a real live raft"! They also went to De Kempervennen, a tropical swimming (indoor) resort near Valkenswaard, for a weekend, where, among other activities, Sofia dressed up as an Indian and a princess. They were due to return on April 17th, but because of the volcanic eruption in Iceland, their trip was extended as a "volcation." Luckily for them, they exchanged their tickets for a return trip on April 21st, and in fact their Delta flight was the first one out of Amsterdam to Seattle since the volcanic disruption.